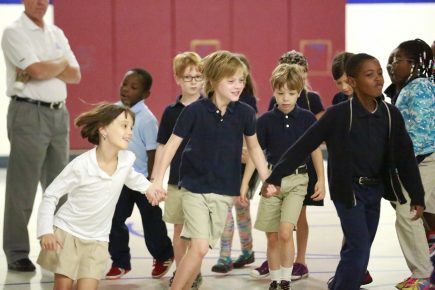 The 6-year-old IPS/Butler Lab School has been so successful and in demand that the Indianapolis Public Schools has asked Butler’s College of Education to create a second school. If all goes as planned, the Eliza A. Blaker School 55 at 1349 East 54th Street, named for the founder of the school that eventually became the Butler College of Education, will become the second lab school overseen by the University. The new school, located about three miles from the Butler campus, would open in fall 2018. The original Lab School, located at 3330 North Pennsylvania Avenue, teaches pre-kindergarten through eighth grade. Officials from Butler’s College of Education officials and Indianapolis Public Schools (IPS) are still discussing which grades would be taught in the second lab school. The IPS Board is expected to decide on the second lab school in September. College of Education Dean Ena Shelley said IPS Superintendent Lewis Ferebee and Deputy Superintendent for Academics Wanda Legrand have asked to replicate the first Lab School because of the large waiting list for the current school. The Lab School, inspired by the teachings of Reggio Emilia Italy, is a project-based school that builds its curriculum with the children’s interests in mind. Classes often engage in long-term projects that intertwine into all aspects of the day. The school uses the workshop method for teaching reading, writing, and math, which means that once the students are taught a lesson in that subject area, they are then released to work throughout the room. Children are encouraged to communicate and ask questions of one another during these times, and they frequently work in pairs and groups to encourage communication and problem-solving strategies. In practicing the Reggio Emilia philosophy of teaching and learning, the school considers the environment to be the third teacher. Students are encouraged to explore and interact with their surroundings. Instead, the students choose seating that fits their learning/work style. Nearly all the teachers at the first Lab School are Butler alumni, as is Principal Ron Smith ’88, MS ’96 and Assistant Principal Nicole Ciegelski Kent ’10. 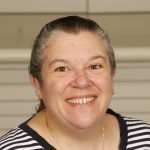 “It is a joy to work with a staff where most graduated from Butler and all share similar values and beliefs about children and learning,” Smith said. Shelley said she is happy to see the Lab School idea expand. We started plans for a second Lab School and painted a 20-by-40-foot mural in Clowes Hall. We challenged the status quo, again, being named the Most Innovative School in the Midwest. We expanded, knocked down an old dorm, started building a new one, and hired a new basketball coach. In 2017, Butler University students and faculty brought excitement and ingenuity to campus and the community around them. Here’s a look back at some of the top stories of the year. 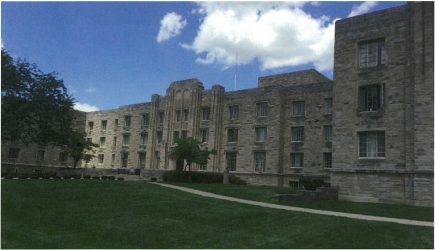 After more than 60 years, the Butler community said goodbye to Schwitzer Hall. The old dorm will be replaced by the new 647-bed student residence hall, set to open in fall 2018. Thanks to a $5 million commitment from Old National Bank, Butler unveiled the Old National Bank Center for Closely Held Business. The Center provides privately owned businesses throughout Indiana training, education, mentoring, and networking opportunities to help them succeed. Items such as Butler’s live mascot bulldog, rare books, fine art, and observatory telescope, can now be insured by Butler’s student-run insurance company. The student-run operation received licensing approval from the Bermuda Monetary Authority, giving students hands-on experience that will prepare them for an industry that anticipates needing 400,000 new employees by 2020. Enrollment in the sciences at Butler has increased nearly 50 percent over the last decade. And to support that increase, Butler alumnus Frank Levinson ’75 gave the University a $5 million gift that will go toward the transformation of Butler’s science teaching and laboratory spaces. These new facilities will enable Butler to collaborate with local and global science and health/life science companies. If all goes as planned, there will be two Lab Schools come fall 2018. The first Butler Lab School has been so successful that the Indianapolis Public Schools has asked Butler’s College of Education to create a second one. The plan is for the second school to be located at 1349 East 54th Street. The Butler Bowl was officially renamed the Sellick Bowl. Butler’s longtime home for football and soccer was renamed in honor of Winstan R. “Bud” Sellick ’47 and his wife, Jacqueline (Blomberg) ’44. The Butler Arts Center unveiled its first commissioned piece, The Journey from Outside In. It was a 20-by-40-foot painting by Indianapolis artist Justin Vining that required 263 hours of work spread over three months and 25.5 gallons of paint. 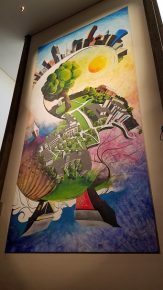 Vining’s painting, which will hang in the Clowes Memorial Hall lobby for a year, depicts sunrise over the Indianapolis skyline, the Butler campus, and farmland on the outskirts of town. Butler got 40 acres larger with the official purchase of property and buildings from Christian Theological Seminary. Butler’s College of Education will move into the main building on the CTS campus beginning with the 2018–2019 academic year. CTS will continue to reside on campus in a part of the main building, counseling center, and apartments. 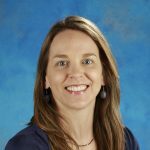 Education professors Susan Adams and Brooke Kandel-Cisco are part of a team that will be recognized with a B.E.S.T. Award from WFYI (Channel 20) for its “exemplary work ethic and performance” and its efforts to develop a curriculum guide for the station’s documentary Attucks: The School That Opened A City. Adams and Kandel-Cisco worked in partnership with educators from Indiana University-Purdue University Indianapolis and Indianapolis Public Schools (IPS) to create the curriculum guide, which exists as an online resource and can be found here. IPS students have been viewing the documentary. about his process for making documentaries. The story of Crispus Attucks High School is a difficult part of Indianapolis’ racial segregation history. The documentary showed that even though this school was “designed to fail,” it succeeded by most measures. Green’s documentary debuted last year. The WFYI B.E.S.T. Awards were established in 1995 to recognize individuals who form teams to accomplish tasks and projects in a timely and efficient manner. The award honors the memory of three extraordinary WFYI volunteers: Rowena Bush (the “B” in best), Bill Ehrich (the “E”), and Don Sandstrom (the “S”) for their outstanding service and teamwork (the “T”). This year’s awards will be presented on April 20 at WFYI. Sixteen school superintendents from across Indiana will participate in Butler University's second annual Educators Preparing Inspired Change (EPIC) program, a yearlong leadership excellence program designed to transform the business and constituent-services aspects of their work. The superintendents, who are listed below, will come to Butler six times in 2018, beginning January 18, for sessions in strategy development, budgeting/finance, change management, community/stakeholder outreach, building a high-performance team, and board relations. "The challenges facing our public school districts are well documented," said Dr. J. T. Coopman, Executive Director of the Indiana Association of Public School Superintendents (IAPSS). "Budget cuts, increased class sizes, and socioeconomic conditions require our public school superintendents operate in an environment of rapid change and uncertainty. EPIC will support Superintendents transformative growth in leadership to thrive in this new reality." 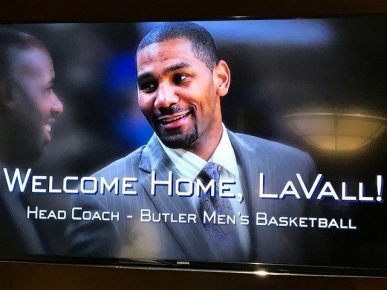 The EPIC program is a joint venture of Butler University’s College of Education and the Lacy School of Business in partnership with Indiana Association of Public School Superintendents (IAPSS). -Brent Lehman, North Adams Community Schools. -Timothy LaGrange, Southwest Dubois County School Corporation. -Amanda Whitlock, Clinton Prairie School Corporation. -Jeremy Riffle, Triton Community School Corporation. -Lynn Reed, Salem Community Schools. -Paul Ketcham, Batesville Community School Corporation. -Andrew Jackson, Sunman-Dearborn Community Schools. -Charles Cammack, Fort Wayne Community Schools. -Timothy Edsell, Nineveh-Hensley-Jackson United School Corporation. -Jana Vance, Rochester School Corporation. -David Clendening, Franklin Community Schools. -Shawn Price, Flat Rock-Hawcreek School Corporation. -Andrea Mobley, Monroe County Community School Corporation. -Timothy Taylor, Jac-Cen-Del Community School Corporation. -Karl Galey, Lawrenceburg Community School Corporation. -Robert Moorhead, South Ripley Community School Corporation. Twelve school superintendents completed the first EPIC program. They are: Robert Evans, Shelby Eastern Schools; Deborah Howell, Franklin County Community School Corporation; Jim White, Bremen Public Schools; Thomas Hunter, Greensburg Community Schools; Scott Deetz, Madison-Grant United School Corporation; Ginger Bolinger, Duneland School Corporation; Gregory Walker, Brownstown Central Community School Corporation; Steven Baule, Muncie Community Schools; Matthew Prusiecki, Metropolitan School District of Decatur Township; Lisa Lantrip, Southern Hancock Schools; Scott Olinger, Plainfield Community School Corporation; Sam Watkins, Peru Community Schools. Sixteen school superintendents from across Indiana will participate in Butler University's second annual Educators Preparing Inspired Change (EPIC) program.